While the trend of wearing costumes Let's Make a Deal began as a simple attempt for auidence members to get picked as contestants on the long-running game show, the costumes quickly became so wild and outlandish, viewers tuned in just to see what the audience members were wearing. Let's Make a Deal was a game show which ran in peak popularity from 1963-1976 and aired on both NBC and ABC as a nightly, weekly syndication. While today, the popular game show still exists on Univision, the original beloved show is no longer filmed or aired as reruns in the United States. Hosted for many years by Monty Hall, viewers watched as hopeful contestants slowly starting arriving in the film studio wearing unique and bizarre costumes. 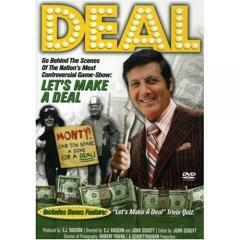 When filming first began for Let's Make a Deal, costumes weren't part of the package. Contestants arrived in typical suits and dresses with the hope of getting selected by the host to make a deal. While many prizes were well worth the risk of trading with the host, some unlucky contestants made a deal for a "zonk," which was basically an unwanted booby prize such as a junked car, junked clothing, or an odd wild animal. Within a few weeks of the first airing, a couple scattered contestants began wearing silly hats and outlandish suits so that the host would notice them amongst the crowd. The trend caught on and within just a month of airing, the audience came bedecked in silly garb to every airing, making the game show not only suspenseful, but equally entertaining. If you are planning a costume idea for a group, you may choose to dress as the host and the contestants of the popular Let's Make a Deal game show. Since you can use your imagination and get as wild as your heart desires, every member in the group can be individual. Here's a few ideas for costumes, Let's Make a Deal inspired. Farm Animal: Who doesn't love an obnoxious chicken costume as either a mascot or a Halloween choice? Large farm animals are one of the most laughable of all creatures to recreate. You can opt for a standard chicken costume, or get creative with another feathered friend, such as a peacock. Whether you choose to make your costume of opt for store-bought, you can expect to get the giggles when donning a silly animal suit. Nursery Rhyme Inspired: For the ladies, Little Bo Peep is a popular favorite that is both juvenile and silly at the same time. You can further this creative idea and opt for another classic such as Alice in Wonderland inspired costumes. Renaissance Costumes: Medieval costumes always garner lots of attention for their fine details and rich textures. Both men and women can opt for medieval garb, just plan on wearing lots of heavy fabrics and undergarments to authenticate the look. Gnome or Elf: If you want to wear a silly yet joyful costume, a gnome or elf is a classic choice. When paired with a white beard and a small red hat, you can let your mischievous personality shine. To pull your group theme together, someone will need to dress as Monty Hall. This costume is an easy choice for any man. An old pinstriped brown polyester suit paired with a striped tie and white dress shirt is all you need to recreate Monty's nightly look on Let's Make a Deal. Make sure your hair is slicked into a 1960's inspired comb over and paired with sideburns for an authentic retro look. You can buy adhesive sideburns if need be and darken hair to Monty's brunette hue with a spray-on temporary color. You'll need a few props, such as game cards and a microphone and you're ready to show up to your next dress-up party in style. While these ideas can be modified as needed, you'll find the most outlandish costume ideas come from your own creativity and items on hand. The sky is the limit when creating a unique idea- so let your imagination take the lead!